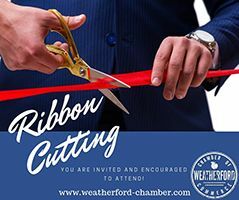 The Weatherford Chamber of Commerce exclusively offers ribbon cuttings and ground breaking to its members. We are pleased to organize and publicize our member's ribbon cuttings, grand-openings and ground-breaking. Sending out invitations to our Ambassador Committee, Chamber Board of Directors and Members. No store front- have your ribbon cutting at the Chamber office. Contact the Chamber to Schedule your Ribbon Cutting! While the Chamber invites Chamber Ambassadors, City officials and Chamber Staff, we encourage businesses to invite clients, vendors, neighboring businesses, family and friends to ribbon cuttings. This is not only to have a large gathering for photo opportunities; it enables the business to showcase its assets to more people in the community. Celebrate this great event by having festive décor—balloons and company signage not only draw attention to your business, it brings a celebratory spirit to the ceremony and makes it easier for attendees to locate your business. We encourage member businesses to have refreshments, snacks, cake, etc., for attending guests. This also adds to the flair of the event! Give guests a brief tour of your company and explain its function. You may never know what this can do for making business contacts in the future! 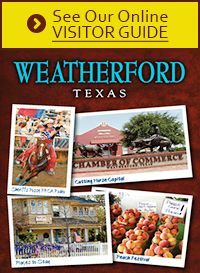 Copyright ©2008-2019 Weatherford Chamber of Commerce. All rights reserved.